United Nations, New York, November 20 2018 – Actress Millie Bobby Brown briefs press on the importance of empowering children, as part of UNICEF’s commemoration of World Children’s Day. The briefing also served to announce Brown’s appointment as UNICEF’s newest (and youngest ever) Goodwill Ambassador today at the UN Headquarters in New York. Photo: Luiz Rampelotto/EuropaNewswire. UNITED NATIONS, November 22 — For this year’s World Children’s Day, UNICEF named their youngest ever Goodwill Ambassador Millie Bobby Brown, the 14-year old star of “Stranger Things” on Netflix. UNICEF’s annual World Children’s Day is commemorated each year on 20 November and marks the anniversary of the adoption of the Convention on the Rights of the Child. The global day raises awareness and vital funds for the millions of children who are unschooled, unprotected and uprooted. At UNICEF Millie Bobby Brown joins a list of Goodwill Ambassadors including Leo Messi, Muzoon Almellehan, David Beckham, Orlando Bloom, Jackie Chan, Priyanka Chopra, Danny Glover, Ricky Martin, Liam Neeson, Shakira and Lilly Singh. UNICEF produced for World Children’s Day a video with some of these — Millie Bobby Brown, Orlando Bloom, Liam Neeson and Lilly Singh. The UNICEF video has its Goodwill Ambassadors going about their daily lives. Liam Neeson bakes blue cupcakes while reenacting a famous scene from “Taken.” Dua Lipa is in the studio re-recording the lyrics of her global hit Be The One from red to blue. Orlando Bloom is on a film set working under his new name – Orlando ‘Bluem’ – and Lilly Singh is at home blending ‘blunicorn’ smoothies. 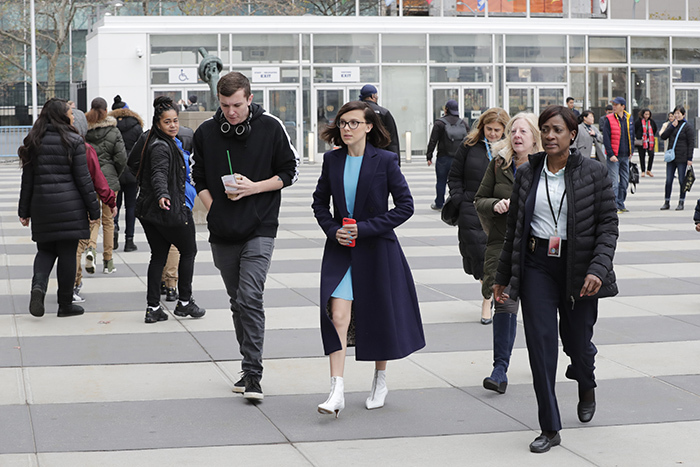 Before a November 20 press conference at the UN, Millie Bobby Brown went to the Empire State Building in midtown Manhattan for the ceremony to light the building blue that evening, to mark World Children’s Day. UNICEF said other landmark structures around the world were also going blue, including the Sydney Opera House in Australia, Beijing National Aquatics Center, Water Cube in China, Petra in Jordan, and The Galata Tower and bridges on the Bosphorus in Turkey. Children symbolically took over parliaments in Montenegro, Peru, Tonga, Suriname and Zambia, amongst others. The Taoiseach of Ireland (Prime Minister), Leo Varadkar, participated in a ‘Kids Takeover’ of his office. UN child rights experts reminded the international community of the challenges youth face around the globe and urged UN Member States to scale up efforts in their defense. UNICEF is calling on activists and supporters to sign its global petition, urging world leaders to demonstrate commitment to fulfilling the rights of every child, and acknowledge these rights as non-negotiable. With Millie Bobby Brown’s quick witted response online on World Children’s Day, the campaign is off to a good start.